This is obviously true of the food we serve, but it goes deeper than that. We buy locally, not just because it provides you with fresher, healthier food, but also because it makes for a healthier community. Buying local means we are supporting our neighbors, our friends, people we develop relationships with. We don’t have to wonder about where our food came from, we have shaken the hands of the people who grew or raised it. And, we do know those growers well! We choose them because they share our values of raising food in a sustainable way that causes the least harm to the environment. Animals are grass-fed and raised without hormones. Most of our produce is grown organically, some of it right here at The Cove in our kitchen garden! We don’t stop at food. We now have almost 60 Texas-brewed beers on tap in our Texas Beer Garden! When you come to The Cove and enjoy one of these great beers, you are supporting a local craftsperson, someone who has lovingly and with care created the particular brew you have chosen. You are not just having a great time out with friends and family, you are supporting the local economy, in a very direct way. The bottom line is we are all about celebrating Texas and all it has to offer, by supporting our local ranchers, farmers and craftspeople. The Cove is locally owned & operated by me, Lisa Asvestas and a wonderful team. Our passion is healthy, delicious food and live music. The Cove restaurant was born in April 2001 as an after thought to a carwash and a coin laundry. In the beginning we only served ice cream and hot sandwiches. As I discovered that I truly enjoyed the hospitality business and food; I continued to expand the restaurant. We were now a smoky bar, that served bar food. In 2003 I began studying Ayurveda. Ayurveda is holistic medicine from India. It teaches balance in life and most importantly that food is either healing and nourishing or poisonous. I began to change my eating habits, getting rid of processed food and fake food. There was a contradicition about the food I was serving but would not eat myself. So I took the leap-and made The Cove my platform for Eat Well! Live Well! The Cove will always be a work in progress. Always striving to do things better. The Cove has been the hardest thing I have ever done, but also the most rewarding. 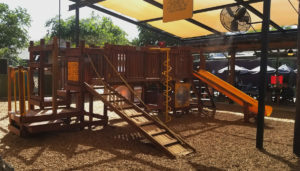 There are convenient tables right beside the Playscape area, so you can remain close to your children at play as you enjoy items from our food menu, and our various live entertainments. For your pleasure, we have both indoor and outdoor dining. Our San Antonio weather provides ample opportunity for a charming meal at a table outside on the patio.